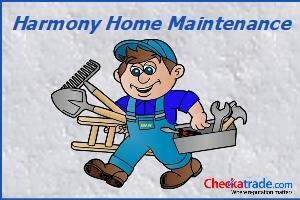 Harmony Home Maintenance - Home Improvements based in Asselby, North Humberside. Polite, Professional, Prompt and always tidy up when finished leaving your home as good as it was when I arrived. Hi, my name is Darren and I am Harmony Home Maintenance, sole trader, animal lover and family man. My services include most internal and external DIY jobs you can’t do or don’t have the enthusiasm or equipment for. I can put up shelves, pictures, mirrors and curtain poles for you. I can also call in and refix the curtain poles you’ve had hanging of the wall and which annoy you every time you walk into the room. Did you ever want your TV on the wall – I can put this up for you. I can also clean out your gutters with the latest equipment, safely and without using ladders. I can show you what’s going on up there with my remote CCTV system. Other stuff includes garden maintenance, leaf tidy-up, hedges and trees cutting back. Do your UPVC window and doors annoy you? I can call round and adjust or repair your windows and doors. Just moved in or an undesirable just moved out? I can change your locks for your peace of mind. Flat pack furniture giving you nightmares – I can assemble your furniture, anything from a small TV table to room units, wardrobes, beds from Ikea, next etc. Maybe you are sick of looking at an old piece of furniture and need it dismantling and taking outside for rubbish – I can do this for you too. I enjoy my work and would be happy to help you with what you need doing. My reputation is my business so you can be assured of my attention at all times. Call today for an honest discussion about your needs and a great price too! !